I really love meals that don’t take a huge amount of effort on my part. The oven does most of the work and I just transfer things from one place to another until dinner just “comes together”. Such was the case with this meal. I started with a few potatoes. Much depends on how many mouths I’m feeding at any given meal, but I usually try to stick with the “one-and-a-half potato per person” rule if I’m just roasting these bad boys. I diced them into chunks and then diced a half an onion to add some flavor. Once these were done, I tossed both in a bowl with some balsamic salad dressing and laid them out on a baking sheet to roast for an hour or so in a 375 degree oven. Since the potatoes were going to take awhile, I started the chicken a little after I had the potatoes in the oven. I had purchased “thin cut chicken breasts” from the store, with the intention of using them for my chicken prosciutto rolls, but totally forgot to pick up the Boursin cheese. Instead, I had 6 lovely thin chicken breasts that I decided to simply saute on the stove top. I seasoned them, using more of the same balsamic salad dressing that I’d put on the potatoes, and then added more salt and pepper for good measure. Using a heavy skillet, I sauteed the breasts in a little olive oil and butter until they were nicely browned and cooked through. Since there were six breasts in the package, I did them in two shifts so they didn’t crowd the pan and cooked more evenly. Once the outsides were nicely caramelized and toasty, I removed them to a platter and popped some foil on top to keep them warm. Note: I also put the platter into the oven for about 5-7 minutes before dinner was ready to reheat just a touch. With all the yummy bits that were left in the pan, I thought a nice gravy was in order to make dinner to come together. I put a pat of butter and a spoonful of flour into the skillet and let the fat/flour combine and sizzle a bit to cook off the raw flo ur taste. I then added a healthy helping of James River Meritage Red Wine (I chose the Meritage simply because that’s what I had in the fridge… I could have just as easily switched out the red wine for James River Reserve Chardonnay. Use what you have available or what you like best) and whisked the gravy together to incorporate the flavors and pick up all the bits that had been left in the pan from the sauteed chicken. After tasting the gravy, I adjusted the seasonings with some salt, pepper, and dry Italian seasonings until I was satisfied. Oh, and I had thrown some broccoli florets on top of the potatoes (after the potatoes were almost finished) so we’d have a green vegetable for dinner… this was purely for my benefit, since none of my guys have any interest in eating green vegetables unless they’re coerced. For serving, I put a single layer of the roasted potatoes/onions on the plate and topped them with a chicken breast and some pan gravy. Obviously, this picture is of the plate I made up for my son, since there are two breasts on the plate and not a speck of green to be seen. It was a really tasty dinner, even if I was the only one to eat the green stuff. Maybe you’ll have better luck with your family if you top their broccoli with a little gravy? 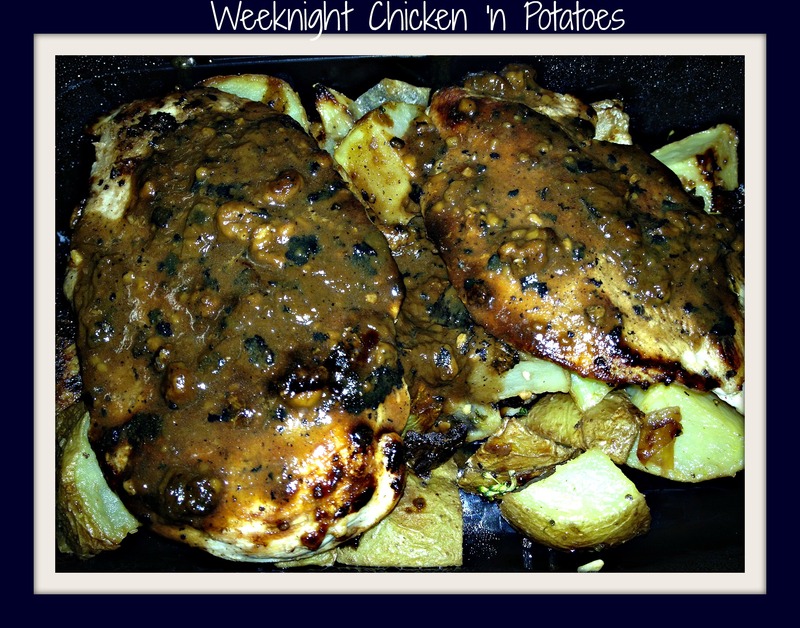 This entry was posted in Cooking, Recipe, Wine and tagged chicken breast, easy recipe, gravy, James River Cellars Meritage, James River Cellars Reserve Chardonnay, potatoes, weeknight dinner.